IF Floyd Mayweather comes back – who should he fight? It really does seem as though there will be talk of ‘one more time,’ or ‘one more fight’ revolving around megastar Floyd Mayweather Junior until he is around 45 years of age. A recent report courtesy of TMZ Sports strongly suggested “Money” is keeping himself in fantastic shape because he has not entirely ruled out the idea of having a 51st fight. Many boxing websites picked up on the story, along with the websites of more than a few newspapers, and it’s clear Mayweather is still, and pretty much always will be, big news. It’s somewhat ironic how a fighter who has so often been referred to as “boring,” or “safety-first” is always being asked to come back and fight again. But if – and it could be a big if, but you never know for sure especially when taking into consideration Mayweather’s absolute love of money – he does return, who should Floyd get it on with? Does Mayweather, at age 41 (in February) fancy a go at one of the young guns of his current division? If so, does Mayweather like the idea of going in with the unbeaten fighter who many list as the best welterweight in the sport today? If it proves to be a yes, Mayweather will get much respect from the fans. 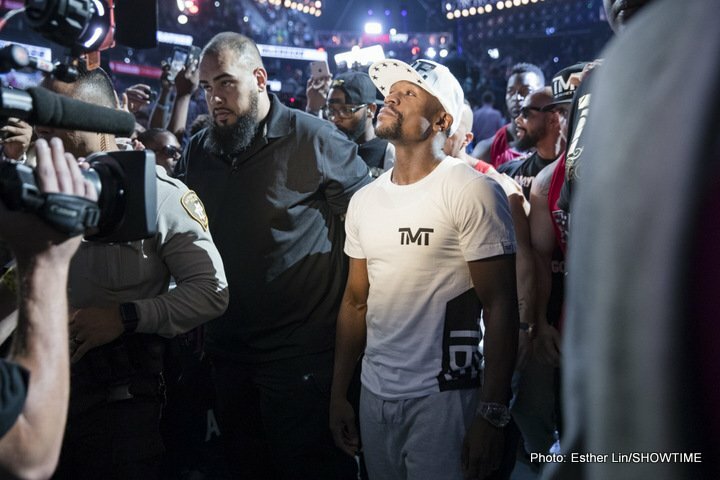 And imagine if the still-formidable skills and boxing brain of Mayweather proved to be too much for “One Time.” How much would this swansong of a victory add to Floyd’s already considerable legacy? The ultimate fight, the ultimate risk. Just imagine the pay-per-view numbers this one would generate! Mayweather, going for the middleweight crown, his sixth weight class to conquer – who wouldn’t pay to see it? Of course there seems to be next to no chance that Mayweather, a smart and clever fighter (has there ever been, in the long history of the sport, a fighter more able to call the shots than Mayweather? No, in this department, Floyd really is “T.B.E”) will actually take this fight, but we can dream. Should Mayweather and Pacquaio meet again, so as to repay their debt to the fans who got screwed big time with fight-one? Why not, in light of how disappointing the so-called “Fight of The Century” was back in May of 2015? With a fully fit Pac Man going up against Mayweather in the final fight of both men’s’ great careers, this one would actually make sense. Just as Ali and Frazier should have both called it a career after their third and final fight, and Leonard and Hearns, so too could Mayweather and Pacquiao walk away together. Unless of course Pacquiao won the return, in which case there would be the need of a rubber-match! Again, not a fight that is likely. But, hey, you’d watch the rematch if it did happen, wouldn’t you? Another possible rematch, and actually one the Mexican superstar wants himself. If Canelo can beat Triple-G (in May, should they actually fight again then) his stock would soar and he would be able to negotiate a pretty good deal for a return with the only man to have beaten him (officially at least). Canelo has said the decision loss he suffered at the masterful hands of Mayweather has been “like a thorn in my side,” and he would certainly like to try and remove it. Vegas, in September of 2008 – Mayweather-Canelo II for the world middleweight title! Wow. You are here: Home / Boxing News / IF Floyd Mayweather comes back – who should he fight?